It is the month of March, first week after the colorful festival of Holi. This is the first Holi of Nonu's life which she could truly appreciate, without getting scared and enjoy, getting colors on to people and throwing water on to them and as she tells me she thoroughly enjoyed and by implication, so did I. In between, she got herself a bicycle, the first one which she can drive on, the one of Blue color, with some yellow around the rims of the wheel and has been to the neighborhood parks couple of times riding on it. This morning, like a sensible, mature child, which she sometimes decides to acts as as a surprise to her unsuspecting parents, brushed her teeth and had shower, without the usual tantrum, getting ready to walk with me through the Forest park near by on the Sunday. 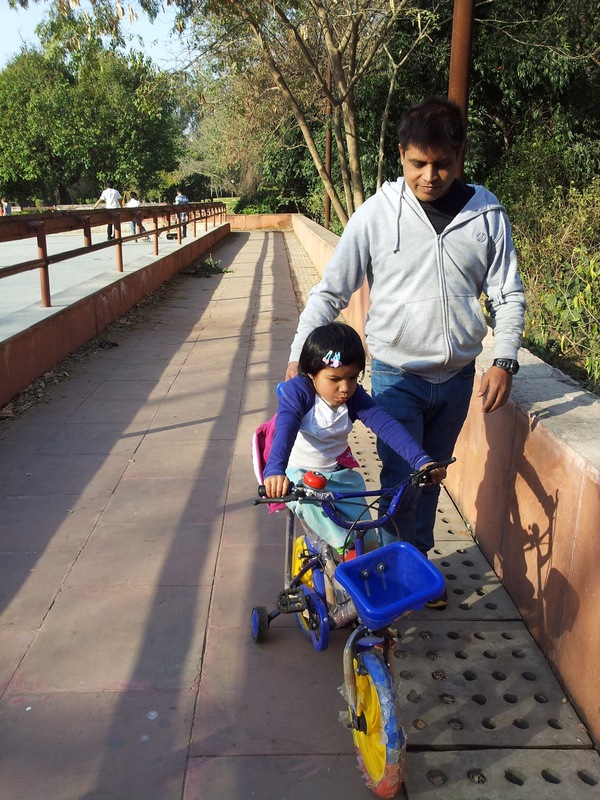 So we were in the Park, the foresty part of the twin park, which she has named as Baba Park (after her father, yours truly, as against the other half with manicured lawns and carefully designed pathways, with flowers abound, which she has named as Maa Park after her mother). I do love to believe that she has named them so simply because of which one of the parent usually takes her to which one of the park and not because she has taken inference from the their respective outlooks. Sun is out, with a modest and youthful aggression, the kind which does not fill you with disgust and annoyance but rather brings in with it a sense of optimism, a playfulness and a bountiful courage. Amid the dense trees of the pseudo-forest park, Sun rays create a beautiful and ornate patchwork of light and shadows on the fallen leaves on the ground. Weather has not yet fully warmed up, and carries a slight nip, as flowers come full bloom on the trees lining up the roads of the capital. In something which has almost become like a weekly ritual, I set her up in the middle of the triangular portion of the park, as I jog for three rounds as she waves enthusiastically and and encouragingly every time I cross the place which is closest to where she is seated. I guess, running is the one thing which I can undertake to begin with on a Doctor's advise given the solitude and privacy it offers. I know it is idiotic to believe that people out there in Gyms out of their own necessities or narcissistic needs would find a man of my age struggling with bench press of any interest to glance even a sideways glance, but there are some dark corners of my intellectual defeat that I keep mostly ignored. Well, we come back home with some satisfaction for having done some exercise, settle on the Sofa, as the channel accidentally shifts to the one on which Ra.One is playing. The little one is totally charged up. She jumps and shouts like a teenage, rock music aficionado suddenly discovering her idols in front of her, in person, before finally snuggling off to watch the movie as I dutifully doze off. There is a limit of patience, and forbearance, how many time can an adult, thinking man watch that movie? As I bask in the warmth, love and attention, a thought strikes me. How very small is the window of intimacy which life offers to a father and how very soon he is to drift into a distance as a remote and largely cold figure, a kind of star in the north of the sky, bereft of all the warmth and glory, a far and distant compass to the offspring which he or she only likely to need, if at all, on the darkest and loneliest of nights, when the way seems to be lost. I think, all attempts to uphold or denigrate your own gender is unmerited fishing for sympathy from the other one and camaraderie from the fellow gender members, seeping often through modern day conversation because language is largely going amiss in the world of SMS, and weather no longer makes an interesting conversation; such conversations are usually intellectual props used to make one feel intellectually taller than one really is. But parenting pleasures are truly so terribly skewed away from the father and the father mostly figure as an antipathy to fun, a ruthless governor who only finds mention as a threat when the child seems to be going out of hands. He is the fun-killer, till the time he becomes an in-absentia parent, absorbed in his work, with nothing but a loathing for the work he does and longing for an embrace to the child which never comes. The window for the father to have fun is truly very small and it is hard to stay content with that. His world is doomed to be the one of unreturned love, and we have to struggle hard to make the most out of it.